With Christmas right around the corner, we're sure many of you will be treating yourselves to a new computer. Realizing that, AMD is doing its best to tempt you with a shiny new hexacore CPU with today's release of the Phenom II X6 1100T, their new six-core flagship processor. In true AMD fashion, the company has priced its latest entry at a very reasonable $265. That's the same rate as the older Phenom II X6 1090T, which has been lowered to $230 to make room for the new 1100T model. While today's review is focusing on the launch of the new Phenom II X6 1100T, which brings a mere 100MHz speed bump, we suspect most of you will be more excited about the prospect of a six-core Black Edition processor for a little over $200. After all, the new 1100T is only clocked 3% higher than the 1090T, while both feature fully unlocked clock multipliers, essentially making them one in the same. The Phenom II X6 1090T was the only unlocked hexa-core processor in AMDs arsenal, as the 1055T and 1075T both feature fixed clock multipliers making them less effective overclockers. Pricing between these processors couldn't be any tighter with just $50 separating the 1055T and the 1090T Black Edition model. 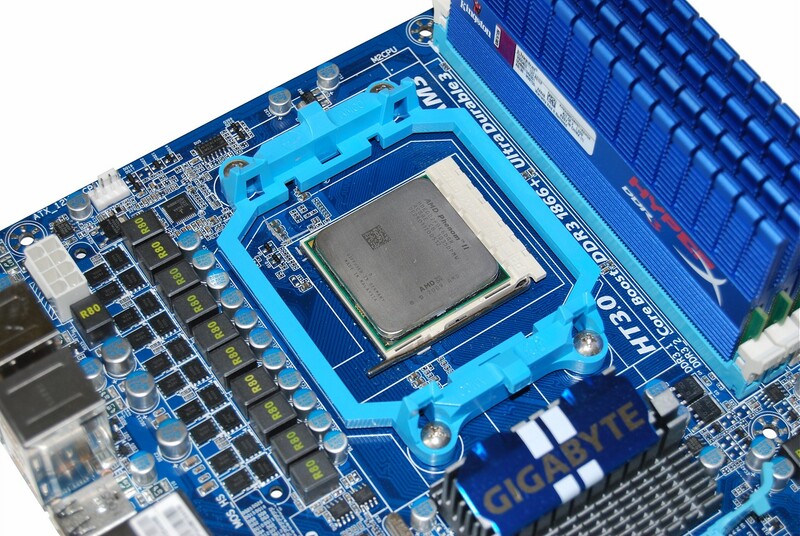 Released last April, AMD's Phenom II X6 range has been surprisingly successful. It's not that they aren't worth purchasing, but they are somewhat overkill for the average user as most applications are only just beginning to take full advantage of quad-core processors and there are very few that can utilize more than four cores. For the most part, gaming with the Phenom II X6 will deliver the same experience as the Phenom II X4, making it somewhat of a pointless option for gamers. Additionally, the Phenom II X6 is designed for heavily-threaded workloads, so it would be a waste for people that use their computer for basic tasks compared to a chip with fewer, but more efficient cores. Generally, only professionals require this kind of grunt and that's probably why Intel has turned its six-core processors into cash cows by specifically targeting the high-end market with exuberant pricing. That said, there is surely a strong demand for modestly priced processors that can tackle heavily-threaded workloads, and that's precisely where AMD's offering steps in.